Amidst all the hullabaloo around tomorrow, I decided to take a break from All Things Turkey and make something completely different. 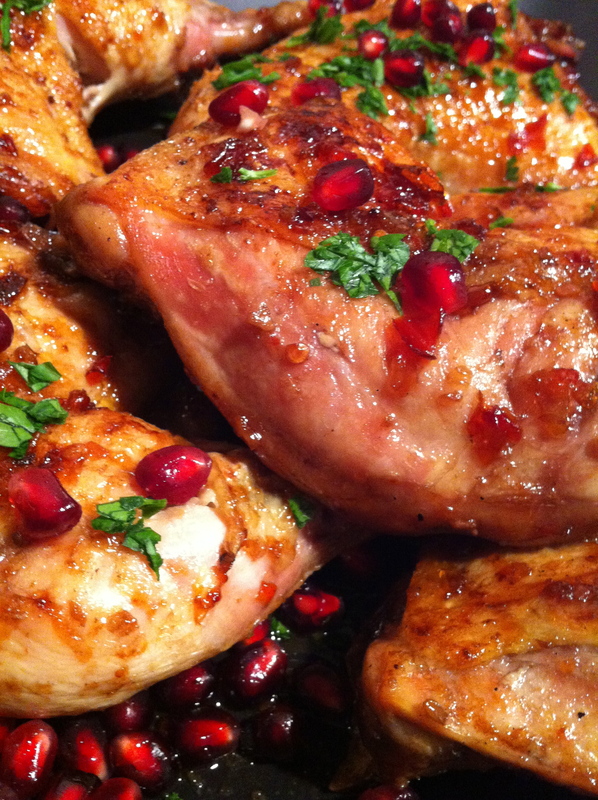 I made Sweet and Sticky Pomegranate Chicken with Basmati Rice for dinner tonight. Now – I gotta be honest with you. I misread the recipe. I thought the recipe called for 4 pounds of chicken. No. It served four PEOPLE. It called for *2lbs*. Luckily I had enough of the other stuff to double the recipe. Oh – be aware that this recipe has QUITE the kick to it. We decided to reduce the sauce after the pan came outta the oven and at first you’re like, Wow! This is really goo- HOLY CRAP! That’s quite a KICK. Yowsa!! Now, the sauce doesn’t have enough of a kick to need to guzzle a whole bucket of water, but it’s DEFINITELY too spicy to feed C’s 92 year old grandmother that joined us for dinner tonight. 2 pounds Chicken wings or legs **I used Chicken Quarters…The frozen kind you buy in a 4lb bag from BJs or Costco or something. 1/2 cup Sweet Chili Sauce **When I doubled the recipe it was a lotta spicy for us. I’d recommend using HALF. 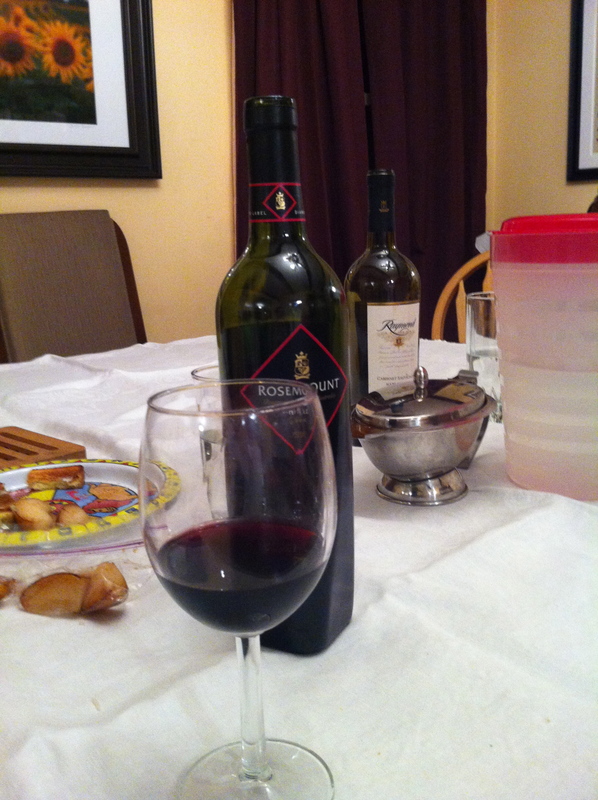 1/3 cup Pomegranate Juice **Damn this stuff is expensive! 3 Tablespoons Brown Sugar **I used Dark Brown. 1- Preheat oven to 375 degrees F. In a large measuring cup or bowl, mix together chili sauce, pom juice, soy sauce, vinegar, lime juice, brown sugar and garlic. 2- Heat a large oven-safe skillet over medium-high heat and add olive oil. Season chicken with salt and pepper, then place in the skillet and sear on each side until deeply golden and brown, about 2 minutes per side. **HA. Chicken took longer to brown. It always does. 3- Remove chicken and place on a plate, turning heat in the skillet down to medium-low. 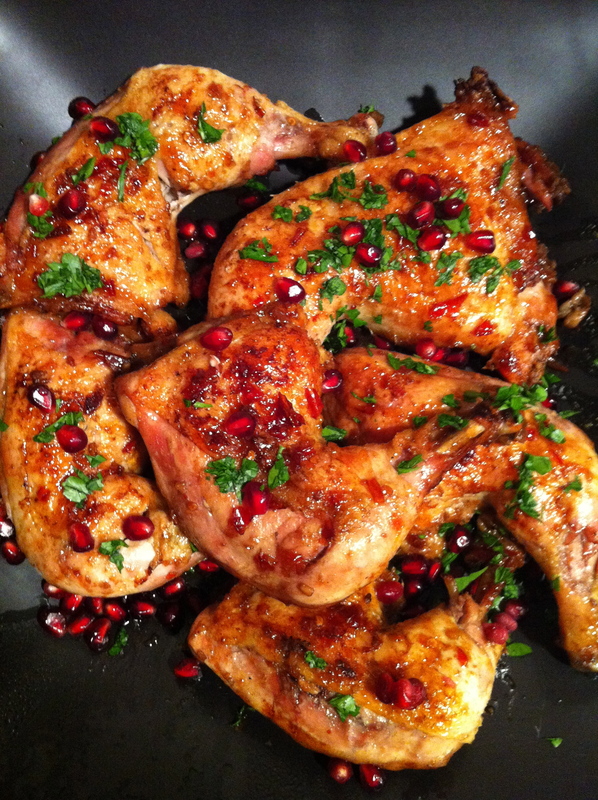 Pour in pomegranate juice mix and whisk, allowing the sauce to bubble and simmer for 1-2 minutes. Place chicken back in the skillet and turn and toss to coat. Bake for 20-25 minutes. 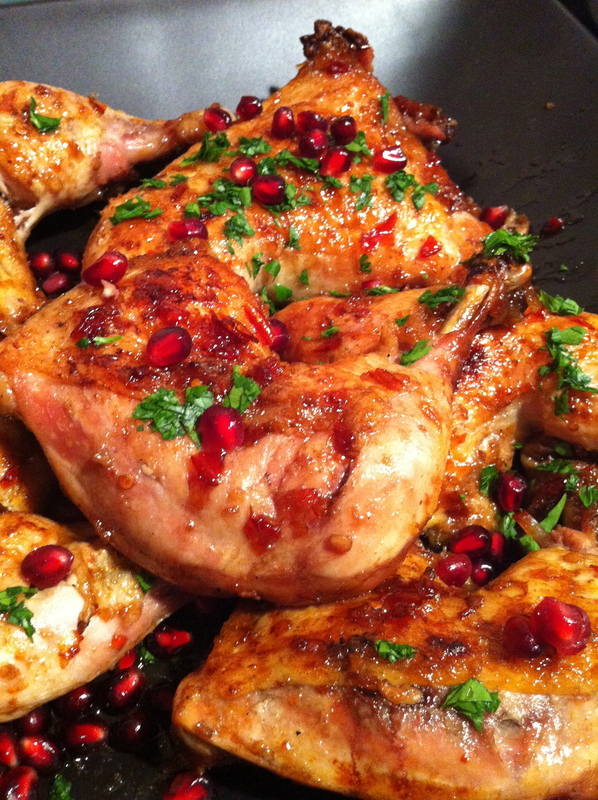 Remove chicken and serve with chopped parsley and pomegranate arils. **Chicken NEVER only takes 20-25 minutes, regardless of what the recipe says. It ALWAYS seems to take at least 45 minutes. Also, C wanted it to get dark and be all crispy, so we put the pan under the broiler for a few minutes. Like 5. Now, the chicken wasn’t like touching the broiler or anything, it was in the upper third of the oven. It came out goooooood! 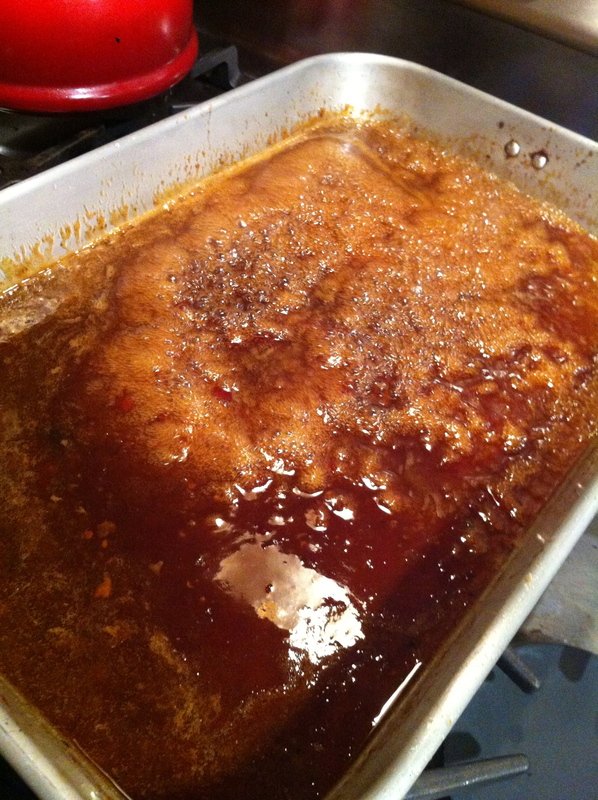 4- If you want to serve the sauce over the top of everything, like gravy, you’ll need to reduce it a little. We simply took the chicken outta the pan, tented with foil to keep a little warm, then put the pan over a couple of burners on the stovetop. Brought it to a boil and let it reduce to about half. My Mother-in-law said NEXT TIME I make this recipe – those little words make me so happy! – I should use half the spice and maybe add more chicken. 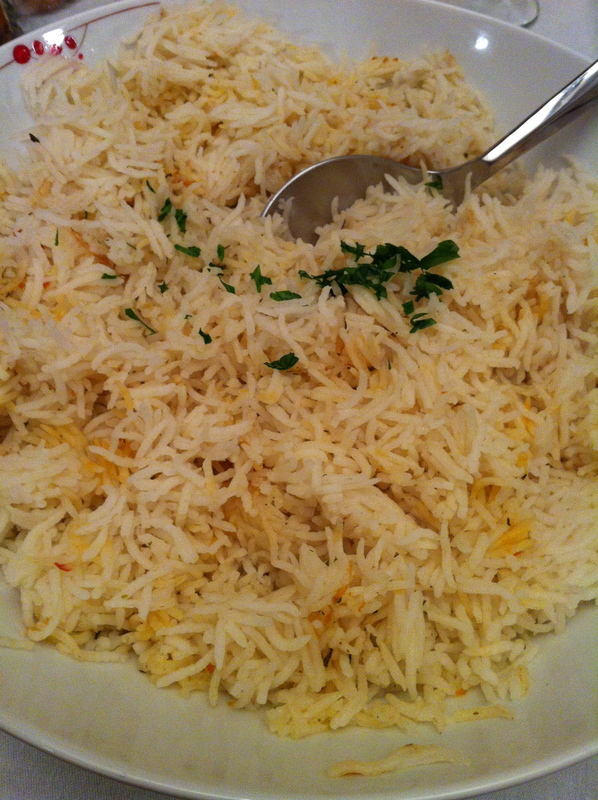 Oh, and I served this over some Basmati rice made with stock instead of water. This looks delicious! I love pomegranate. I love it too! Such a great ingredient. Funny enough, I`ve never used it as an “ingredient” – I`ve only eaten it as is, by separating the arils and eating them one at a time. C and I have an ongoing discussion: Do you eat the fruit and spit out the pits or do you eat the arils whole? I spit out the pits. But I`ve seen recipes similar to yours where the arils are but one ingredient of many and I assume they`re intended to be eaten whole.